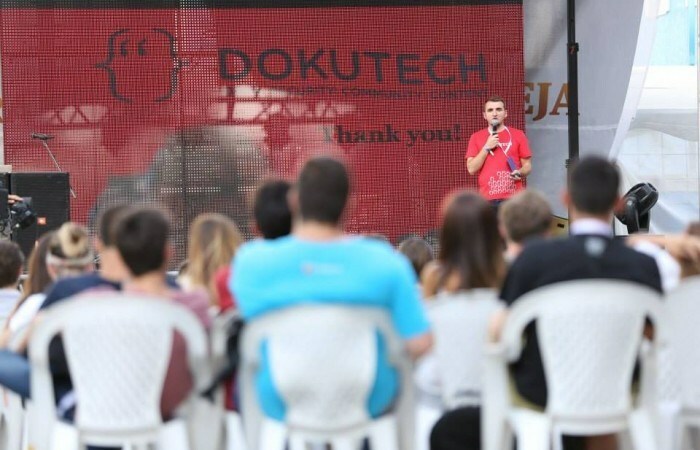 Under the fresh and chilly breeze of Andrra, DOKU:TECH started the third day of the Conference. Considering the fact that the topic was Community, the talks were very pleasant to listen to as well as easy to follow. The Sabaja craft brewery made sure that the process of brewing beer was explained in detail, while cold beers kept the audience fresh. The first speaker DOKU:TECH started with was Celik Nimani. The topic of his talk was Hacking Education. He said “Everyone wants a University Degree, because everyone thinks it will lead to a job.” He continued: “ There will be no Digital Transformation without building a more suitable infrastructure for an Innovative generation”. The next speaker for the day was Teresa Crawford- board member of IPKO Foundation. She commenced her presentation by telling her story on how she got strongly connected to Kosovo and the activities she was involved in. She said: “IPKO Foundation is now because of the foundation of IPKO Telecom and IPKO institute and we have these great projects for Kosovo”. Next was a panel discussion on Digital Transformation of Public Sector. The panel consisted of Celik Nimani, Kushtrim Xhakli, Bernard Nikaj, Redon Skikuli, William Nesen and Agron Demi. “The first step that we need to do is to get rid of the gap that is created and to make a better way to Digital Transformation” said Redon Skikuli. It was Pedro Noel’s and Michele Orru’s turn to deliver their talk. At the beginning they warned the audience that their talk would be the best they heard so far. They said: “One of the big purposes of Whistleblowing Initiative is to show that this can work and this movement will be as Open Data one day soon”. Workshops for the day were: How to brew beer, Free your computer, Citizen science, environmental monitoringn and DIY actions and Open Maps. This was the third great day of the conference. Tomorrow, same time at the same place.